A day of music will round out the summer season at Alton Towers. The concert, entitled "Rhythm & Rides", will take place on Sunday, 26th August and last from 1pm to 9pm. 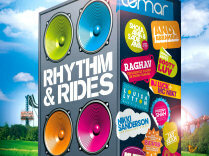 Confirmed acts include Lemar, Andy Abrahams, Booty Luv and Raghav. Several soap stars will also be in attendance, including Louisa Lytton (Ruby Allen, EastEnders), Pooja Shah (Kareena Ferreira, EastEnders) and Nikki Sanderson (Candice Stowe, Coronation Street). The concert will take place in a restricted area, so only guests with event tickets will be able to see the show; guests with normal day tickets will not be granted access to the arena. Annual Pass/Season Ticket holders will also not be given access without event tickets. Tickets are only available by calling 0870 999 1160. There are a limited number of tickets for £35 (£27 for under 12's), otherwise they cost £45 and £37 respectively. The event ticket also covers park entry for the day. Alton Towers is a family park, not just a thrill park - take the whole family.